Tomorrow starts my 28-day healthy living challenge. I've been doing a lot of reading on the subject, and I'm really interested to see how this all plays out. I think the keys to success with this are (a) diversity and (b) creativity. I've heard from so many people that their attempts at going vegetarian and/or vegan were thwarted by either boredom or intense cravings, so I've been researching ways to combat both. I have nothing but time on my hands, so trying lots of new recipes is not out of the question. And I'm incredibly open to trying new things, from different combinations of ingredients to foods I've never tried before. I've reviewed the information Whole Foods sent me about the basic gist of the eating plan, and essentially I'll be eliminating something from my diet each week: first up, dairy. This is a relatively easy baby step for me into plant-based eating, as I don't really consume much dairy to begin with. I don't like milk and I can't keep cheese in the house. The biggest transition here is giving up the breakfast I've had almost every day since August: yogurt. I bought a container of oats to make oatmeal and started yesterday with some oatmeal, pumpkin pie spice, and a banana. It's delicious, but my newly mathematical brain is a little worried. My cup of light yogurt is 100 calories; oatmeal and a banana is 260. I am trying so hard to stay within 1200-1300 calories, and lately, it's been a struggle. Some days are 1400-1500 ... some are a lot more. I'm eating my stresses, and while I hit the gym hard enough to work it off, I am upset that I'm emotionally eating again in the first place. Especially with my plant-based diet research, I've been thinking a lot lately about "junk" food. 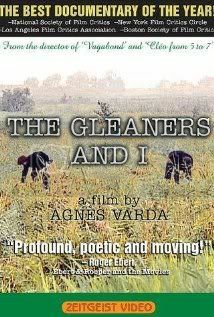 A few weeks ago, I showed my students a documentary by Agnès Varda called "The Gleaners and I" ("Les Glaneurs et la glaneuse"). We had been talking about the ways that we measure time and how we spend our days, and this was an incredible film showing non-traditional means of recycling and reusing products. In the documentary, Varda shows people who go out in fields after a harvest to pick up any remaining food: tomatoes, potatoes, cabbages, grapes, etc. 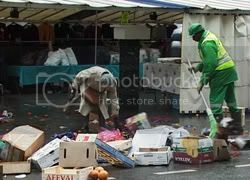 She also shows urban gleaners who scavenge through grocery store dumpsters and empty market stalls looking for still-fresh produce or items freshly past their sell-by dates. It's still good to eat, but the stores need to discard it to make room for fresher items. The reactions of my students were varied, and I was really quite pleased with the discussions they had afterwards. One of the questions I asked them was if they thought they could survive as gleaners in modern Chicago. One student said absolutely not - what if his friends saw, or his neighbors put a video on YouTube of him going through trash cans? A few students said they might, but only if they were absolutely certain that the food was sanitary and still fresh enough to eat. In general, most of the students seemed open to the idea of gleaning - of course, this was under hypothetical circumstances, and their reactions might have been different in practice than they were in theory. I watched the film before screening it, then showed it to each of my three classes, so I got to notice some of the more subtle nuances of the film. Something that struck me was that the gleaners all referred to what they were collecting as food, but the store owners (and my students) all called it garbage. The gleaners are taking mostly fresh produce, with very limited meat and cheese, and that's garbage - but we're okay with going into a store, paying full-price for junk food, and thinking nothing of it. I closed the discussion with a question: who do you think eats the best, you or these gleaners? I didn't require an answer, but I could see their minds actively considering the idea. What about you? Do you think you could be a gleaner? What, if anything, would stop you? (Besides laws, of course.) Any low-calorie (and dairy-free) breakfast ideas? Just found your blog - interesting topic! I'll have to check out that movie. We have a charity here called "The Gleaners" and they glean farms & then chop the food and dehydrate it for soup mixes - and have sent them all over the world! Haiti was their big one after all their difficulties. I think it's a wonderful ministry! As far as breakfast ideas, you could do a green smoothie with greens, frozen berries, half of a frozen banana and coconut or almond milk. It's my favorite way to start the day. I'm not sure if I could be a gleaner. The thought of picking food out of a garbage pile kind of sickens me. I'm a bit of a germaphobe. But those gleaners do eat much better than most Americans! You could try toast and hummus. I use a deli thin (100 calories) and a serving of hummus (usually 50 calories) The smoothie idea is also a good one. I've never heard of "gleaning".... Interesting!!! I want to see that film now! It sounds interesting. I think your last question is a very good one. I would bet that the Gleaners eat healthier than most of us. And just the thought of climbing in a dumpster kinda makes me feel dirty so that's what would stop me. Good luck with your calories! Pretty much the basis of my post today was summed up in the above sentence. It's sometimes difficult for other people to understand that if they aren't true emotional eaters, think. You have a plan though, Mary. You will figure it out and thrive on it; of this I am sure. Loved your interview over at Tim's blog, btw. So grateful to have you sharing yourself with this community. Oatmeal! 1/2 Plain quick oatmeal covered in water and nuked for 45 seconds and then add 1 tbsp peanut butter and either a sliced banana OR 1 tbsp sugar free jelly on top. It comes out to 255 calories for the PBJ oats and 353 with the PB- Banana. Another option that is pretty darn good is the same oatmeal but instead of PBJ you add 2 servings of non-dairy flavored coffee creamer. It's about 4 tablespoons and comes out to about 215 calories. It's super good with Irish Cream or Caramel Macchiato! I love oatmeal and eat it almost every morning! I can't wait to see how your vegetarian eating goes, I hope you post some of the new recipes you try! I've heard about people like this but they were called freegans instead of gleaners. I think I could do it if my situation dictated that I needed to, but I'm also thankful to be a comfortable situation where I don't need to think about such things.